The laid-back island of La Digue Seychelles, although only half the size of neighbouring Praslin, offers its visitors stunning palm-fringed beaches, rare wildlife and an off-the-beaten-track feel that will have you wishing you’d stayed longer. Although easily accessible for a day trip – only 15 minutes by fast ferry from Praslin – it’s well worth spending a little more time on what is without doubt one of the most beautiful islands in the Seychelles Archipelago. The main attraction of this tranquil paradise are the unspoilt beaches - with their caster-sugar sand and turquoise waters - dotted with granite boulders of all sizes along the water’s edge; the most famous - Anse Source d’Argent – is said to be one of the most photographed beaches in the world! Aside from its beaches, La Digue has other hidden treasures for those willing to explore, both underwater and above. The calm waters of the north and west coasts are ideal for snorkelling, whilst the pristine reefs offshore, rich in aquatic life, are a big draw for scuba divers. Back on land you can take a sightseeing tour in an ox cart taxi, but by far the best way to see the island is to hire a bicycle. Roads are sealed, paths are reasonably flat and distances relatively short, and if you need a break, you can stop at a roadside stall for a refreshing local fruit juice or smoothie. The centre of activity is in La Passe where the jetty, banks, shops and majority of services can be found. Stretching from the northern tip of the island and running down to the west is where most of the accommodation can be found. Small resorts and local guesthouses make up the majority of the lodgings, although there are a couple of luxury resorts to be found. Dining on La Digue is a very informal affair with typical creole cuisine featuring heavily on most menus. If octopus or fruit-bat curries are not your cup-of-tea, there’s a selection of international fare as well as an excellent pizzeria. The pace of life here may be slow but there’s still a wealth of things to see and do. So when you’re not relaxing on the beach or snorkelling in the crystal clear waters, there are breath-taking views from atop Nid d’Aigle, a bird sanctuary, coconut plantation, horse riding, fishing and some of the most stunning sunsets you’ll ever see! Anse Source d’Argent – As the name suggests, this is one of the main reasons that visitors come to La Digue. With its soft white sand and calm turquoise waters, flanked by spectacular granite boulders, it’s no wonder that this beach is reputed to be one of the most photographed in the world. Ideal for relaxing under a swaying palm or snorkelling in its sheltered waters, Anse Source D'Argent is accessed via L’Union Estate where an entrance fee of Rs 100 is charged per person (non-resident) per day. At low tide it’s possible to circumnavigate the Estate and avoid the fee; although it may involve some wading through shallow water. Don’t forget to bring your camera to capture the unique formations of the rocks, weathered by the elements, as you explore the twisting pathways that lead away from the main beach to hidden coves and secret caves. Grand Anse, Petit Anse & Anse Coco – A series of adjoining bays on the island’s southeast coast play host to some of La Digue’s other highlights. These picturesque beaches, separated by granite boulders and backed by lush tropical forests, epitomise everything one would expect from a tropical coastline. Starting at Grand Anse, park your bicycle and wander along the golden sands of this sweeping bay. The pounding waves often attract local surfers but with powerful undertows, it’s not ideal for swimming. At the eastern end of the beach a path through the vegetation will lead you up and over to the smaller and quieter Petit Anse, another tranquil postcard-perfect beach. For those willing to explore a little further, a steep path leads you away from Petit Anse, meandering through the forest until descending into a clearing and ending at the isolated Anse Coco. It’s quite a hike, but for those who make it the extra walk is repaid with one of the most isolated and unspoilt beaches on the island; perfect for rest and relaxation. Just make sure you bring enough water with you as there are no facilities, and there’s still the walk back to you bike! Be Warned: These beaches, along with a number of others on La Digue, are subject to powerful waves and strong seasonal currents. Warning signs are clearly displayed on beaches where extra caution should be taken. L’Union Estate – This World Heritage site is one of the most visited places on the island, partly given to the fact that you need to pass through the estate to access Anse Source D’Argent. However the estate itself is steeped in history and has lots to offer, making a visit worthwhile. Highlights include the old French colonial-style Plantation House and a traditional Copra Mill – one of the last working examples in the Seychelles – where visitors can watch a demonstration on how coconut oil is extracted. The estate is also not only home to the cemetery of the original settlers of La Digue. As you pass through the estate you’ll also encounter a large pen where Seychelles’ giant tortoises roam as well as a spacious paddock where the estate’s horses are available for hire. Veuve Natural Reserve – Tucked away in the middle of the island, this small forest reserve plays home and last refuge to the rare Black Paradise Flycatcher; known to locals as veuve (widow). Lucky visitors may spot the long black tail-feathers of this elusive bird (male) as it flies through the takamaka and Indian almond trees. Entry is free and there are several walking trails that will guide you through the reserve; although the ranger may be persuaded to take you on a short tour. The reserve is also home to a large colony of fruit bats as well as some moorhens and a couple of rare terrapin species. The small Information Centre is the only environmental office on the island and has a wealth of information on La Digue’s unique flora and fauna. The remote beach of Anse Marron, located on the island’s southern-most tip, is a ‘must see’ for anyone in search of that true Robinson Crusoe experience. Picture a virtually deserted beach, with powdery white sand and huge granite boulders, balanced precariously on top of each other, forming your own private natural swimming pool. Getting there is quite an adventure but it is well worth the effort. Access is from either Grand Anse or Anse Source d’Argent and you will definitely need a guide (ask at your hotel/guesthouse), a good pair of rock-hopping shoes, water, sun screen and plenty of time. While there are some great snorkelling opportunities on La Digue, for a truly breath-taking experience, head for the crystal clear waters of the Ile Cocos Marine National Park. This group of 3 small coral-fringed islets (which includes Coco Island) are located just off the northern tip of Felicite Island, about 7km north of La Digue. They offer some of the most spectacular snorkelling in the area where you can enjoy swimming with Hawksbill turtles, Blue surgeonfish, Parrotfish, Moorish idols, Emperor angelfish, Batfish or Picasso triggerfish. Popular with day trippers from both Praslin and La Digue alike, visits to park can be arranged by your hotel or with a taxi boat leaving from the jetty. There’s a National Park entry fee of Rs 200 per person for non-residents; keep hold of your ticket, as rangers regularly patrol the park and may request to see it. For the best snorkelling back on La Digue, head to Anse Sévère or Anse Gaulettes - on the island’s northern tip. Enter near the rocks at either of the beach and then glide through the calm turquoise waters where a variety of colourful reef fish, an occasional turtle and sometimes even Eagle rays await you. It’s recommended to bring your own mask and fins as equipment hire on the island is limited. Rising 333 metres above sea level, Nid d’Aigle (Eagles Nest) is the island’s highest peak. The hike uphill is no walk-in-the-park, but for those prepared to huff & puff their way to the top you can expect to be rewarded with breath-taking panoramic views of the nearby islands. Near the top, stop off at the friendly Bellevue Cafeteria. This small bar/restaurant serves cold beers, deliciously refreshing lime juices and a selection of simple dishes, all at reasonable prices given its location. The vivid blue waters around La Digue and its neighbouring islands offer divers of all levels a wealth of possibilities. From breath-taking granite slopes to huge boulders and swim-thru’s, divers can expect to encounter a myriad of species including rays, reef sharks, turtles as well as a prolific fish population. Dive sites not to be missed include Ave Maria, Shark Rock and, conditions permitting, South Marianne. The island’s only operator - Azzurra Pro Dive - organises daily dive trips for experienced divers as well as offering courses for beginners. For those wishing to take in the sights and sounds of the island without breaking a sweat, why not take a ride in an ox cart taxi – the island’s traditional mode of transport. Usually located near the jetty in La Passe, their drivers will happily take you on a guided tour of the highlights or simply transfer you and your baggage to your accommodation. With only around 20 vehicles on the whole island, the best way of getting around is to hire a bicycle. Sealed roads and flat paths will lead you almost all the way around the island, making this the ideal way to explore what La Digue has to offer. Almost all hotels and guesthouses can arrange bike rental, with prices averaging Rs 100 per day (less for longer rentals). Make sure you check the brakes and gears and if you plan to be out after dark, bring a flashlight with you as very few are equipped with lights. 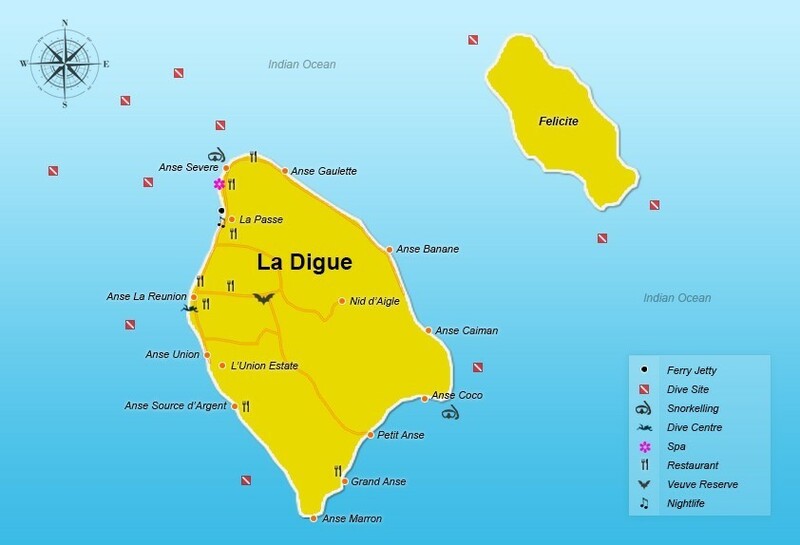 Your hotel or guesthouse will no doubt offer breakfast and perhaps dinner, but if you’re looking for somewhere to go for lunch or just an alternative dinner venue, La Digue has a selection of restaurants and take-away establishments to please all appetites. Le Repaire Italian Restaurant – Arguably one of the best restaurants on La Digue, Le Repaire combines the beauty and flavours of the Seychelles with the fine dining tradition of Italy. Specializing in authentic Italian cuisine, Chef Remo and his team use the best local ingredients along with a selection of imported fare from Italy, to bring you classic Italian dishes with a Seychelles' twist. Aside from some of the best pizzas in the Seychelles, the menu boasts a variety of pasta dishes as well as local fish and imported meats. It goes without saying that the wine list is predominantly Italian! The Fish Trap – This trendy new restaurant, located in the centre of La Passe, is a welcome addition to La Digue’s dining scene. The exciting menu offers a selection of seafood specialities along with other tasty options. The Fisherman’s Bar - a work of art in itself - features a variety of signature cocktails as well as other popular drinks and the outside deck affords panoramic views across the sea, making it a great spot to relax and watch the sun set over Praslin. Gala Takeaway – For some of the best budget eats on the island, look no further than this popular all-day snack bar and fast-food joint. Burgers, sandwiches, fried chicken and pizza slices are all available.... with or without fries. But its main draw is the daily-changing takeaway menu of Creole dishes which, some would argue, could give some of La Digue's more expensive establishments a run for their money. There's inside and outside seating. Just don't get there too late or it'll all be gone! Pizzeria @ Gregoire's – Once you’ve tasted their traditional pizza and pasta dishes, you’ll quickly see why this place is such a popular choice with locals and tourists alike. Great value, friendly staff and probably the best pizza in the Seychelles; highly recommended. Château St Cloud – Set in the grounds of a colonial estate, the restaurant is best known for its weekly buffet evenings, accompanied with local entertainment. Located slightly inland, the restaurant looks out on to the resort’s garden and pool area and serves up a tasty spread of Creole favourites. Lanbousier – Only a stone’s through away from Anse Source d’Argent, this little beach-hut style restaurant is a great option for a lazy lunch. Serving typical Creole dishes at reasonable prices, this place can get quite busy. Update Dec 2015: Due to fire, the restaurant is currently closed for re-building. Light snacks and drinks are still being served from a temporary building and they hope to re-open the restaurant in the new year. La Combova – For something a little more sophisticated why not treat yourself to an evening at this exquisitely designed roof-terrace lounge, located on the upper deck of Le Domaine de L’Orangeraie resort. Using the freshest ingredients, their eclectic menu combines the flavours of the Mediterranean with Asian and Creole accents. There’s a good selection of wines too. Advanced reservations may be required. Bor Lanmer Takeaway – Known by many as “the curry place”, this cheap ‘n’ cheerful establishment in La Passe serves up generous portions of their freshly cooked curries and is great for a quick fix. La Digue isn’t really known for its nightlife; with bars usually closing around 10pm. Many hotels host local musicians who entertain guests at their weekly barbecue buffet evenings. Aside from this there’s not a great deal going on except on the weekend. Tarosa – Just across from the jetty in La Passe, this open air bar/restaurant is where it all happens on a Friday night. Local bands and artists perform a mix of modern and traditional music to a mixed crowd of locals and tourists. Grab a cool cocktail and dance the night away under the stars. La Digue Community Centre – On weekends this is where the local Diguois go to let their hair down. Whether it’s a local band or a disco, visitors are always welcome to join in.